After years of reading about male sleuths, who protect themselves from their own vulnerabilities with alcohol and violence, I am encouraged to see publishers bringing out and promoting crime fiction that explores female experience. One topic recurs more than any other: a woman dealing with the death or disappearance of a child. Although many covers include the phrase ‘every mother’s nightmare’, I think this particular thread is more tightly woven into the human condition than that and may have something to do with our common sense of self, perhaps mourning our lost childhood or wondering about the adult we might have become if we had taken different turnings on the way from then until now. Helen FitzGerald’s fourth novel, The Cry, sees her heroine battling with the familiar frustration of a baby who won’t stop screaming. To add to her distress, they are on a 21-hour flight fromScotland to Australia, which forces her to face the other passengers’ loathing of her inadequate mothering skills. At the airport Joanna was forced by a security officer to pour her own medicine and the Calpol she is carrying to soothe Noah from their own bottles into others small enough to comply with the anti-terrorism regulations. 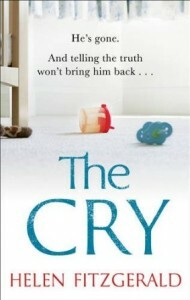 Much later, when they are driving away from Melbourne airport, her husband realises that Noah is dead. Assuming that she must have muddled the bottles when she intended to dose Noah with Calpol and in fact given him her own medicine, Alistair tells her they must pretend Noah was stolen from the back of the parked car while they were distracted. He will protect her and she will know nothing of where or how Alistair disposes of their son’s body. Maternal guilt, at first sparked in a small but powerful way by her inability to stop Noah disturbing everyone on the aeroplane, takes on a new and anguishing intensity with the knowledge that she must have killed him. The novel is told in the third person from Joanna’s point of view and in the first by her predecessor as Alistair’s wife, Alexandra. FitzGerald moves backwards and forwards in time, making it clear during the narrative that Joanna stands trial for murder but withholding the details. She tightens the readers’ nerves inch by inch as she takes us through the weeks after Noah’s ‘disappearance’. There are plenty of twists to keep us guessing, while the emotional intensity of the novel is increased by the directness and conversational informality of the style. FitzGerald picks just the right small physical details to skewer each agonizing moment. The child at the centre of Hilary Bonner’s The Cruellest Game is already into girls and exam stress when his mother finds him hanging from the beams in his bedroom. Convinced that he could not have killed himself, she searches for evidence to persuade the police and then for reasons to explain why anyone else would have wanted to kill him. She has been his prime carer throughout his life because her husband works on the rigs off Aberdeen and can rarely get home. As she discovers aspects of her son’s life that she never suspected, she is also forced to understand a lot about her self and her husband. While the emotional intensity is not as powerful as FitzGerald’s, the narrative zips along. 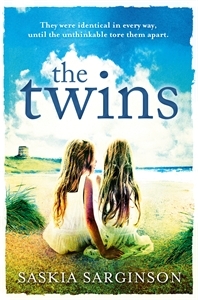 Saskia Sarginson’s first novel, The Twins, takes a quite different look at a child’s disappearance and likely death. Set between 1972 and 1987, it tells the story of Isolte and Viola, twin daughters of a hippy-ish single mother, from their point of view. Having escaped from a scruffy, smelly commune in Wales, the three are now living in an unsanitary cottage in Suffolk. The girls often truant from school and are clearly difficult in many ways. Their mother makes rag dolls to sell, talks about the importance of freedom, and ekes out her small resources by foraging for as much free food as she can find. The girls fall in with twin boys from a violent family and get into all kinds of trouble. When their mother starts going out with a stolid widower with a daughter of his own, Issy and Viola are furious. Their treatment of his daughter, a sensitive, scared, musical goody-goody, is clearly going to lead to trouble. What happens to her and the consequences for everyone else hang over the narrative. 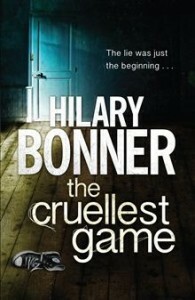 This is not a whodunnit but a whatdidtheydo, and a most engrossing one. 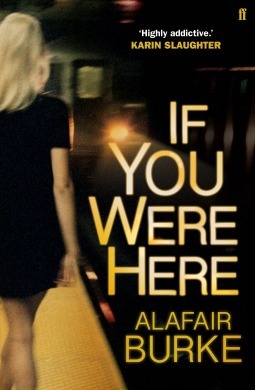 Alafair Burke, a professor at Hofstra Law School, describes If You Were Here as, ‘probably the most personal book I’ve written’. She was once a deputy district attorney and is now married to a graduate of West Point. Her fictional counterpart is McKenna Jordan, who has made a new career as a journalist after a disastrous ending to her career in the DA’s office. During her research for an article she becomes convinced that the victim of a street mugging recorded on CCTV is a long-lost friend, who has been assumed dead for many years. Once again, the narrative moves between the past and present, pulling the reader on through the mysteries that have affected the family and friends of the young woman who vanished without leaving any physical evidence of her going. The set up of the mystery is more involving than the solution, but the relationship between McKenna and her husband, riven with suspicion as they both search for the truth about their mutual friend, is interesting.